Stomatitis is inflammation of the mouth and lips. It refers to any inflammatory process affecting the mucous membranes of the mouth and lips, with or without oral ulceration. In its widest meaning, stomatitis can have a multitude of different causes and appearances. Common causes include infections, nutritional deficiencies, allergic reactions, radiotherapy, and many others. When inflammation of the gums and the mouth generally presents itself, sometimes the term gingivostomatitis is used, though this is also sometimes used as a synonym for herpetic gingivostomatitis. The term is derived from the Greek stoma (στόμα), meaning "mouth", and the suffix -itis (-ῖτις), meaning "inflammation." Aphthous stomatitis (canker sores) is the recurrent appearance of mouth ulcers in otherwise healthy individuals. The cause is not completely understood, but it is thought that the condition represents a T cell mediated immune response which is triggered by a variety of factors. The individual ulcers (aphthae) recur periodically and heal completely, although in the more severe forms new ulcers may appear in other parts of the mouth before the old ones have finished healing. Aphthous stomatitis is one of the most common diseases of the oral mucosa, and is thought to affect about 20% of the general population to some degree. The symptoms range from a minor nuisance to being disabling in their impact on eating, swallowing and talking, and the severe forms can cause people to lose weight. There is no cure for aphthous stomatitis, and therapies are aimed at alleviating the pain, reducing the inflammation and promoting healing of the ulcers, but there is little evidence of efficacy for any treatment that has been used. Inflammation of the corners (angles) of the lips is termed angular stomatitis or angular cheilitis. In children a frequent cause is repeated lip-licking, and in adults it may be a sign of underlying iron deficiency anemia, or vitamin B deficiencies (e.g., B2-riboflavin, B9-folate, or B12-cobalamin, which in turn may be evidence of poor diets or malnutrition such as celiac disease). Also, angular cheilitis can be caused by a patient's jaws at rest being 'overclosed' due to edentulousness or tooth wear, causing the jaws to come to rest closer together than if the complete/unaffected dentition were present. This causes skin folds around the angle of the mouth which are kept moist by saliva, which in turn favours infection; mostly by Candida albicans or similar species. Treatment usually involves the administration of topical nystatin or similar antifungal agents. Another treatment can be to correct the jaw relationship with dental treatment (e.g., dentures or occlusal adjustment). This is a common condition present in denture wearers. It appears as reddened but painless mucosa beneath the denture. 90% of cases are associated with Candidia species, and it is the most common form of oral candidiasis. Treatment is by antifungal medication and improved dental hygiene, such as not wearing the denture during sleep. Allergic contact stomatitis (also termed "allergic gingivostomatitis" or "allergic contact gingivostomatitis") is a type IV (delayed) hypersensitivity reaction that occurs in susceptible atopic individuals when allergens penetrate the skin or mucosa. Allergens, which may be different for different individuals, combine with epithelial-derived proteins, forming haptens which bind with Langerhans cells in the mucosa, which in turn present the antigen on their surface to T lymphocytes, sensitizing them to that antigen and causing them to produce many specific clones. The second time that specific antigen is encountered, an inflammatory reaction is triggered at the site of exposure. Allergic contact stomatitis is less common than allergic contact dermatitis because the mouth is coated in saliva, which washes away antigens and acts as a barrier. The oral mucosa is also more vascular (has a better blood supply) than skin, meaning that any antigens are more quickly removed from the area by the circulation. Finally, there is substantially less keratin in oral mucosa, meaning that there is less likelihood that haptans will form. Allergic contact stomatitis appears as non-specific inflammation, so it may be mistaken for chronic physical irritation. There may be burning or soreness of the mouth and ulceration. Chronic exposure to the allergen may result in a lichenoid lesion. Plasma cell gingivitis may also occur, which may be accompanied by glossitis and cheilitis. Allergens that may cause allergic contact stomatitis in some individuals include cinnamaldehyde, Balsam of Peru, peppermint, mercury, gold, pyrophosphates, zinc citrate, free acrylic monomer, nickel, fluoride, and sodium lauryl sulfate. These allergens may originate from many sources, including various foods and drink, chewing gum, toothpaste, mouthwash, dental floss, dental fillings, dentures, orthodontic bands or wires, and many other sources. If the substance containing the allergen comes into contact with the lips, allergic contact cheilitis can occur, together with allergic contact stomatitis. The diagnosis is confirmed by patch test, and management is by avoidance of exposure to the allergen. Migratory stomatitis (or geographic stomatitis) is an atypical presentation of a condition which normally presents on the tongue, termed geographic tongue. Geographic tongue is so named because there are atrophic, erythematous areas of depapillation that migrate over time, giving a map-like appearance. In migratory stomatitis, other mucosal sites in the mouth, such as the ventral surface (undersurface) of the tongue, buccal mucosa, labial mucosa, soft palate, or floor of mouth may be afflicted with identical lesions, usually in addition to the tongue. Apart from not being restricted to the tongue, migratory stomatitis is an identical condition in every regard to geographic tongue. Another synonym for geographic tongue which uses the term stomatitis is "stomatitis areata migrans". This is inflammation of the mouth caused by herpes simplex virus. Stomatitis may also be caused by chemotherapy, or radiation therapy of the oropharyngeal area. The term mucositis is sometimes used synonymously with stomatitis, however the former refers to mucosal reactions to radiotherapy or chemotherapy, and may occur anywhere in the gastrointestinal tract and not just in the mouth. The term necrotizing ulcerative gingivostomatitis is sometimes used as a synonym of the necrotizing periodontal disease more commonly termed necrotizing ulcerative gingivitis, or a more severe form (also termed necrotizing stomatitis). The term necrotizing gingivostomatitis is also sometimes used. Chronic ulcerative stomatitis is a recently discovered condition with specific immunopathologic features. It is characterized by erosions and ulcerations which relapse and remit. Lesions are located on the buccal mucosa (inside of the cheeks) or on the gingiva (gums). The condition resembles Oral lichen planus when biopsied. The diagnosis is made with Immunofluorescence techniques, which shows circulating and tissue-bound autoantibodies (particulate stratified squamous-epithelium-specific antinuclear antibody) to DeltaNp63alpha protein, a normal component of the epithelium. Treatment is with hydroxychloroquine. Terms such as plasma cell gingivostomatitis, atypical gingivostomatitis and idiopathic gingivostomatitis are sometimes a synonym for plasma cell gingivitis, or specifically to refer to a severe form of plasma cell gingivitis. 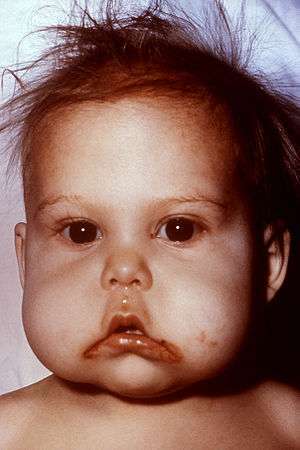 Periodic fever, aphthous stomatitis, pharyngitis and adenitis (PFAPA) syndrome—occurs in children. Uremic stomatitis—a rare form of stomatitis that occurs with renal failure. ↑ Zaoutis, [edited by] Jeffrey M. Bergelson, Samir S. Shah, Theoklis E. (2008). Pediatric infectious diseases. Philadelphia: Mosby/Elsevier. ISBN 9780323076333. ↑ Michael G. Stewart, Samuel Selesnick (editors) (2010-10-04). "35". Differential diagnosis in otolaryngology – head and neck surgery. New York: Thieme. ISBN 9781604062793. 1 2 Yamada T, Alpers DH, et al. (2009). Textbook of gastroenterology (5th ed.). Chichester, West Sussex: Blackwell Pub. ISBN 978-1-4051-6911-0. ↑ Neville BW, Damm DD, Allen CM, Bouquot JE (2002). Oral & maxillofacial pathology (2nd ed.). Philadelphia: W.B. Saunders. pp. 253–284. ISBN 0721690033. ↑ Brocklehurst, P; Tickle, M; Glenny, AM; Lewis, MA; Pemberton, MN; Taylor, J; Walsh, T; Riley, P; Yates, JM (Sep 12, 2012). Brocklehurst, Paul, ed. "Systemic interventions for recurrent aphthous stomatitis (mouth ulcers).". The Cochrane database of systematic reviews. 9: CD005411. doi:10.1002/14651858.CD005411.pub2. PMID 22972085. ↑ Kanerva, L.; Alanko, K.; Estlander, T. (1 December 1999). "Allergic contact gingivostomatitis from a temporary crown made of methacrylates and epoxy diacrylates". Allergy. 54 (12): 1316–1321. doi:10.1034/j.1398-9995.1999.00074.x. PMID 10688437. 1 2 3 4 5 6 7 8 9 10 11 12 Greenberg MS, Glick M (2003). Burket's oral medicine diagnosis & treatment (10th ed.). Hamilton, Ont. : BC Decker. pp. 60, 61. ISBN 1550091867. ↑ Gottfried Schmalz; Dorthe Arenholt Bindslev (2008). Biocompatibility of Dental Materials. Springer. Retrieved March 5, 2014. ↑ Thomas P. Habif (2009). Clinical Dermatology. Elsevier Health Sciences. Retrieved March 6, 2014. ↑ Edward T. Bope; Rick D. Kellerman (2013). Conn's Current Therapy 2014: Expert Consult. Elsevier Health Sciences. Retrieved March 6, 2014. ↑ "Balsam of Peru contact allergy". Dermnetnz.org. December 28, 2013. Retrieved March 5, 2014. ↑ James, William D.; Berger, Timothy G.; et al. (2006). Andrews' Diseases of the Skin: Clinical Dermatology. Saunders Elsevier. p. 63. ISBN 0-7216-2921-0. ↑ Treister NS, Bruch JM (2010). Clinical oral medicine and pathology. New York: Humana Press. pp. 20, 21. ISBN 978-1-60327-519-4. ↑ Principles and Practice of Palliative Care and Supportive Oncology. Retrieved 2014-03-20. ↑ Zeppetella, Giovambattista (2012-06-14). Palliative care in clinical practice. London: Springer. p. 132. ISBN 9781447128434. ↑ Horning, GM (October 1996). "Necotizing gingivostomatitis: NUG to noma.". Compendium of continuing education in dentistry (Jamesburg, N.J. : 1995). 17 (10): 951–4, 956, 957–8 passim; quiz 964. PMID 9533316. 1 2 Coulthard P, Horner K, Sloan P, Theaker E (2008). Master dentistry volume 1, oral and maxillofacial surgery, radiology, pathology and oral medicine (2nd ed.). Edinburgh: Churchill Livingstone/Elsevier. ISBN 9780443068966. 1 2 Solomon, LW (July 2008). "Chronic ulcerative stomatitis.". Oral diseases. 14 (5): 383–9. doi:10.1111/j.1601-0825.2008.01446.x. PMID 18593454. ↑ Scully, Crispian (2008). Oral and maxillofacial medicine : the basis of diagnosis and treatment (2nd ed.). Edinburgh: Churchill Livingstone. ISBN 9780443068188. ↑ Fourie J, van Heerden WF, McEachen SC, van Zyl A (April 2011). "Chronic ulcerative stomatitis: a distinct clinical entity?". SADJ : journal of the South African Dental Association = tydskrif van die Suid-Afrikaanse Tandheelkundige Vereniging. 66 (3): 119–21. PMID 21874892. ↑ Neville BW, Damm DD, Allen CA, Bouquot JE (2002). Oral & maxillofacial pathology (2nd ed.). Philadelphia: W.B. Saunders. pp. 141, 142. ISBN 0721690033. ↑ Janam, P; Nayar, BR; Mohan, R; Suchitra, A (January 2012). "Plasma cell gingivitis associated with cheilitis: A diagnostic dilemma!". Journal of Indian Society of Periodontology. 16 (1): 115–9. doi:10.4103/0972-124X.94618. PMC 3357019 . PMID 22628976. ↑ Kerr, DA; McClatchey, KD; Regezi, JA (September 1971). "Idiopathic gingivostomatitis. Cheilitis, glossitis, gingivitis syndrome; atypical gingivostomatitis, plasma-cell gingivitis, plasmacytosis of gingiva.". Oral surgery, oral medicine, and oral pathology. 32 (3): 402–23. doi:10.1016/0030-4220(71)90201-5. PMID 5285187. ↑ Laskaris, George (2006). Pocket atlas of oral diseases (2nd ed.). Stuttgart: Thieme. p. 12. ISBN 9781588902498.